Pride and prejudice are eternal but while pride made the list of deadly sins, prejudice, curiously, did not. It wasn't, evidently, considered a lethal enough transgression in the ancient world; you will look in vain for references to "prejudice" in ancient writings. It was not considered a fault worthy of comment. But Jane Austen thought differently, prejudice as harmful a social trespass as pride. 2013 is the bicentennial of Pride and Prejudice, Austen's second novel. It has, along with each of her other five novels, become a classic, and has sold some twenty-million copies since its initial publication on this day, January 28, in 1813. It is the rarest of all Austen novels to find complete in its first edition within a contemporary binding. 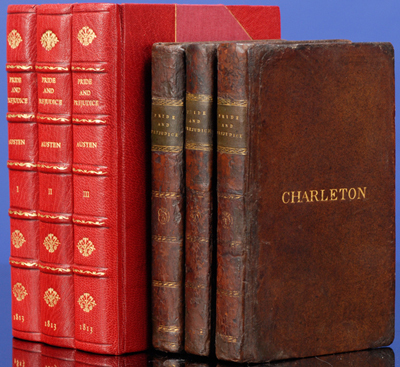 Regency-era binders routinely removed the half titles; copies with all half titles present are scarce: Sadleir, Keynes, and Chapman's copies lacked them, and the half-titles are missing in the copies at the Bodleian and Cambridge University libraries. "The first draft of PP, under the title of First Impressions… (printed as False Impressions by Lord Braybourne)…was written between October 1796 and August 1797" (Gilson p. 23). Austen made significant revisions to the manuscript for First Impressions between 1811 and 1812. She later renamed the story Pride and Prejudice. 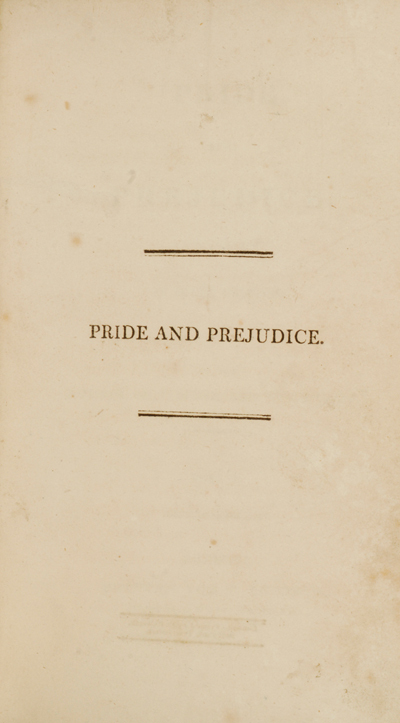 In renaming the the novel, Austen probably had in mind the "sufferings and oppositions" summarized in the final chapter of Fanny Burney's Cecilia, called "Pride and Prejudice," where the phrase appears three times in block capitals. It is possible that the novel's original title was altered to avoid confusion with other works. In the years between the completion of First Impressions and its revision into Pride and Prejudice, two other works had been published under that name: a novel by Margaret Holford and a comedy by Horace Smith. "It was not fully revised until 1812, and the author records on January 29, 1813, that she has successfully 'lop't and crop't' the book" (Keynes). Both Gilson and Keynes suggest that only 1500 copies of the first edition were printed. 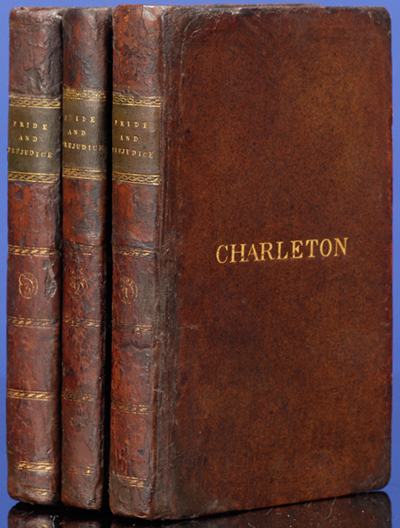 The book was published at 18 shillings in three volumes on January 28th in 1813. Austen sold the copyright to Thomas Egerton, publisher of her first three novels, for £110, not anticipating that it would become an instant hit (if not a fully critical success), the first edition selling out very rapidly with a second edition issued in the same year. I recently had an attractive and complete first edition copy of Pride and Prejudice pass through my hands. Though I cannot be certain, I strongly suspect that the "Charlton" gilt ownership stamp to its contemporary binding is that of Charleton House, Montrose, the home of feminist writer and philanthropist Susan Scott Carnegie (1744-1821) from her marriage in 1769 until her death in 1821. Jane Austen is one of the few authors whose entire oeuvre has attained classic status as masterpieces of ironic social satire streaked with proto-Feminism that have only increased in popularity since their publication. Of Austen, Virginia Woolf wrote, "a mistress of much deeper emotion than appears upon the surface...[possessing an] impeccable sense of human values" (in The Common Reader, Hogarth Press, pp. 102, 104). Jane, wherever you are, make a wish and blow out the candles on the cake without prejudice. This is your day; enjoy it with pride. [AUSTEN, Jane]. Pride and Prejudice: A Novel. In Three Volumes. By the Author of Sense and Sensibility. London: Printed for T. Egerton, Military Library, Whitehall, 1813. First edition, following all points in Gilson and Keynes, and complete with all half titles present. Three twelvemo volumes (6 5/8 x 3 7/8 in; 168 x 97 mm). [iv], 307, [1, blank]; [iv], 239, [1, blank]; [iv, [323, [1, blank] pp. Contemporary speckled calf, blind-tooled board edges, edges sprinkled red, original light brown endpapers. Expertly rebacked with the original spines laid down. Later green morocco gilt lettering labels on spines. Gilt stamped "Charleton" to upper boards of each volume. Edges to a few leaves professionally and near invisibly repaired. Occasional light foxing. An excellent and complete copy in its original and contemporary binding. Gilson A3. Keynes 3. Sadleir 62b. All images courtesy of David Brass Rare Books, currently offering this copy, with our thanks. 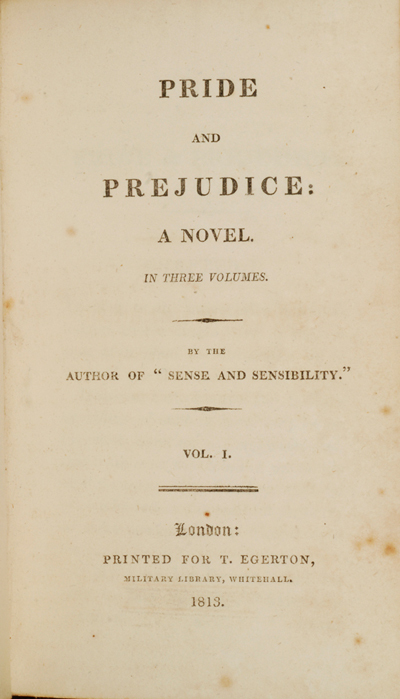 The above is a link to a radical new interpretation of Mr. Darcy's "We neither of us perform to strangers" in Chapter 31 of Pride & Prejudice, which strongly supports the minority position that Andrew Davies did NOT overheat the novel in his 1996 adaptation, if anything he was too conservative in that regard.